Diesel fuel has been identified by at least one OEM as a Root Cause of Engine Fuel System (pump and injector), EGR, EGR Cooler, Sensor, and Turbocharger failures. Ford Motor Company recently issued a new TSB (Technical Service Bulletin) regarding vehicles using the 6.0 Liter PowerStroke engine. TSB 08-2-7 stating that ?Some vehicles with a 6.0L diesel engine may exhibit white smoke, black smoke, lack of power, exhaust odor, surges, or no start as a result of excessive coking deposits (un-combusted or incompletely combusted hydrocarbons). The root cause of the coking must be corrected or the coking may reoccur?. They further state: ?Coking deposits are generally un-combusted or incompletely combusted hydrocarbons and can form on system components such as the EGR Valve, EGR Cooler, EBP Sensor, EBP Tube, Intake Manifold, Turbo Charger, Catalytic Converter, and EGR Throttle Plate?. ?Un-combusted deposits can be linked to delayed combustion events. Delayed combustion events can be a function of hard to ignite elements (poor quality fuel, excessive fuel, engine oil, or excessive exhaust gas recirculation) in the combustion chamber or a delayed injection event (calibration, wire chafe, injector mechanical issue (Sticktion)). ?Un-combusted fuel is usually evident as a fuel scented white exhaust smoke. Un-combusted fuel may create coking which impairs system functionality eventually leading to black exhaust smoke/poorly combusted fuel?. In situations where injectors have built up carbon deposits to the point of not being able to properly atomize the fuel, or EGR Valves that have coked or loaded up with carbon to the point of no longer being able to regulate the Exhaust gas Recirculation, or EGR Coolers that have plugged, to Turbochargers coked to the point of no longer being able to vary their geometry; common practice has been to replace very expensive parts. Later some companies developed systems to "flush" the EGR's and Coolers. Flushing will temporarily improve the operation of the engine, however this type of repair lasts only a short time and the initial problems usually reoccurs. Oftentimes the same parts are replaced many times and then you have the problem where the one part that is not functioning correctly causes other related parts to fail. Ask why and identify the causal relationships associated with the defined problem. Identify which causes if removed or changed will prevent recurrence. Today the Root Cause of 80% to 85% of the diesel engine fuel system related problems is poor fuel quality and fuel characteristics. In the case of the problems described above on the Ford 6.0L and most of the fuel system and related problems found with other diesel engines, the Root Cause of the Failure is poor fuel quality. You can replace parts and flush till the cows come home and you will continue to have the same problems over and over and over again. Note: Albert Einstein once described insanity as: "Doing the same thing over and over again and expecting different results". Ford has recommended the use of a Cetane Booster and Performance Improver to improve fuel quality and reduce coking and un-combusted fuel problems. This is not a Ford only or PowerStroke only problem. 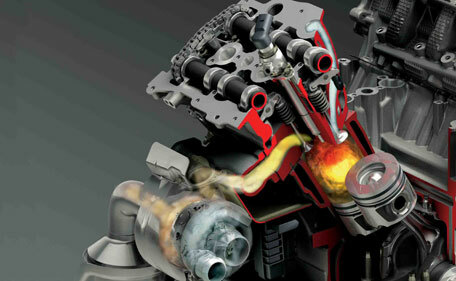 Every engine manufacturer has to deal with these problems in one form or another. Energy Technology Group provides products such as our Pinnacle Fuel Supplement that not only raise Cetane 4 to 6 points, but also provide fuel system and injector cleaning, inhibits corrosion, disperses (removes) water, provides thermal and oxidative stability (this includes storage stability), adds Lubricity, protects o-rings, gaskets, and seals, improves fuel atomization, prevents the buildup of gums, varnishes, and carbon deposits, (coking) cleans up existing deposits, and provides unsurpassed cold weather protection (anti-gel), and wax anti-settling protection. Pinnacle Fuel Supplement goes to the root cause and fixes it before the engine system problems occur.